My friend Yvonne never ceases to amaze me. 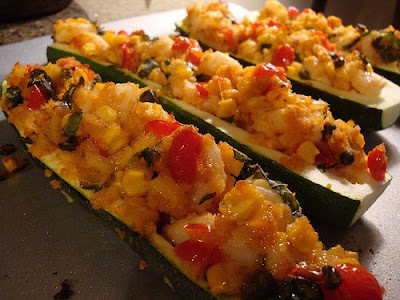 Her food blog The Fifth Tine is one of my favorites, and I couldn't wait to make this Shrimp Stuffed Zucchini. My new man grilled a Rib Eye and took tons of photos of the cooking process. 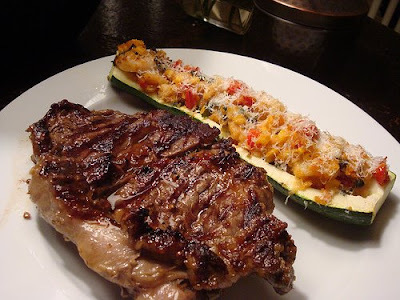 Slice zucchini in half lengthwise and scoop out inner flesh leaving a 1/4 inch lip. Chop 1/2 of the flesh and reserve. 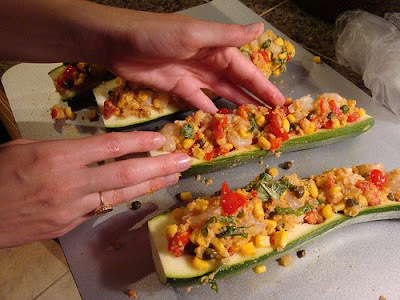 Place zucchini in a baking dish or sheet pan. 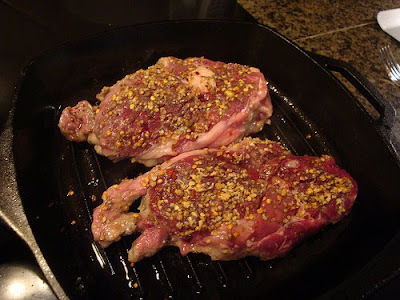 Over medium heat in a non-stick skillet, saute onions and garlic in 1 T olive oil until tender, about 5 minutes. Add crushed red pepper, corn, diced zucchini from above, tomatoes, lemon juice and capers. Saute for an addition 2-3 minutes. Turn off heat and mix in shrimp, breadcrumbs and basil. Season with salt and pepper. Fill zucchini halves with mixture and bake for 15 minutes. 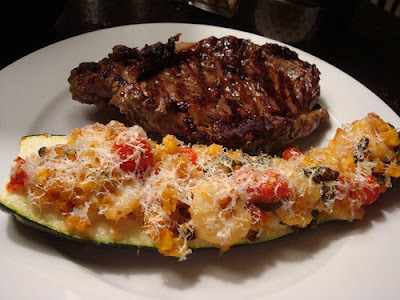 Remove from oven and top each zucchini with parmesan cheese and a drizzle of olive oil. Return to oven and bake for an additional 5 minutes. Enjoy! 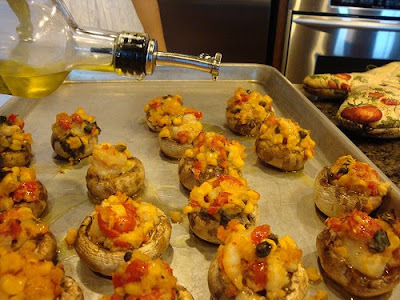 **Post mortem note: I used the leftover stuffing to make stuffed mushrooms the next night, and they were great!